The Spektrum DX6 conjures up moments of deja vu for those of us who have been involved in this hobby since 2005. So what has a decade of Spektrum advancements managed to achieve with this next generation DX6? Even if you don't now much about RC Radios, when looking back at the original DX6, it's easy to see the new 2014 edition is a far superior product brimming with features and quality that is generally only seen on intermediate and high end radios. 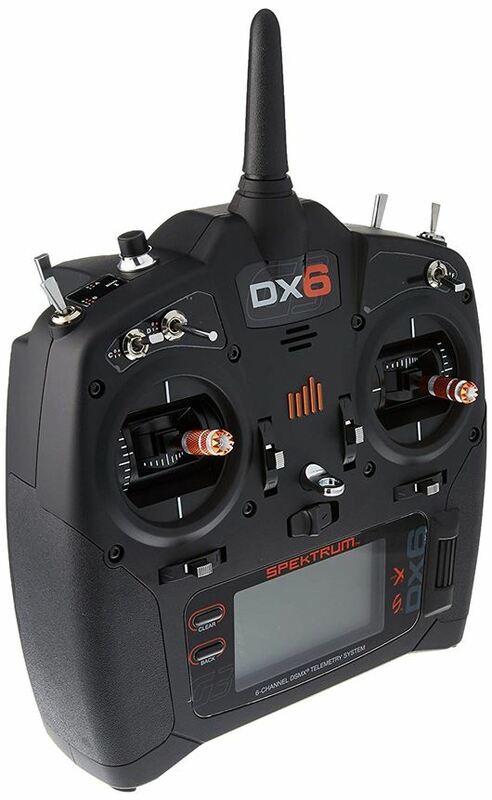 If you're thinking the this new Spektrum DX6 looks somewhat familiar to the DX7, DX8, and DX9, you are right on track. It shares the same basic architecture as all the new gen black cased Spektrum transmitters and feels very similar in hand with the same good ergonomics. What's a surprise however is how many of the DX9's features have filtered down into this entry level computerized radio. This makes it perhaps the best value of any quality entry level computerized radio currently on the market with a retail price tag of $230 bucks including the AR6600T Receiver. I can't recall off the top of my head, but I think that's the same price the original DX6 was selling for back in 2005-2007 before the introduction of the now legendary DX6i (that link is to the review I did on it). I just finished a full heli build for a customer who sent me his DX6 to program to the new machine and I was so impressed! What a radio for the price! Where to begin? Well, I suppose voice alert is as good a place as any to start with since it was such an impressive feature that most of us were drooling over when the DX9 was first announced. I love voice alert as it really helps you know what is going on in real time without looking at the screen. The programability of voice to switches, modes, timers, telemetry, etc is vast! You name it, there is likely a voice command for it. The only issue is going through the seemingly hundreds of commands to find the ones you want to use. It's both fun and frustrating, but so well worth it. As with all of Spektrum's latest generation computerized radios, the new DX6 also supports telemetry for things like monitoring the aircraft battery voltage, RF signal strength, temperatures, airspeed, rotor speed, etc. This is where voice alert once again really comes in handy. You can have it call out telemetry data or warn you if preset defined value/s is/are reaching or exceeding the limits you programmed. While actively piloting a collective pitch RC helicopter, not having to worry about glancing down at the screen is a huge asset. Telemetry data can also be recorded on the SD card for later analysis. Full switch programming is possible, most toggles are 3 position for the ultimate in usability, and you can even adjust travel speed of all the channels. Remember, this is a $200 entry level radio! Talk about bang for the buck! The next impressive quality feature that has filtered down from the DX9 is quad bearing gimbals. When you feel the difference between the DX6's butter smooth gimbals compared to that of the old DX6i, it's an impressive improvement! Being a RC helicopter guy, I'm very impressed that the Spektrum DX6 has both 7 point pitch and throttle curves (the original 2005 version had 3 point curves). 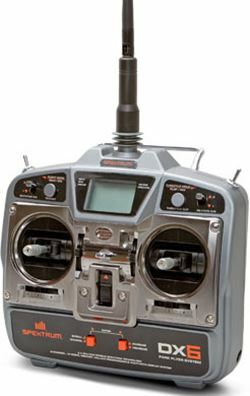 You really don't need 7 point curves to properly setup a CP heli (5 is generally enough); but it's just one more added feature that floats the DX6 to the top of the entry level computerized radio pond. 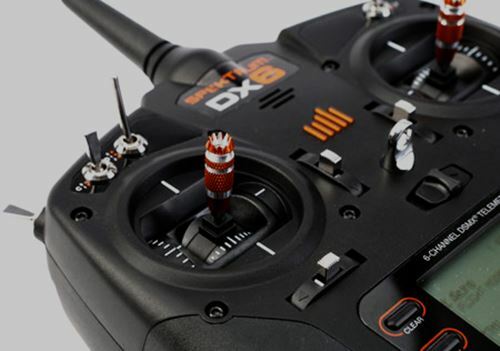 The new Spektrum DX6 is also using 3 position flight mode toggle which is a great addition from the DX6i's two position FM toggle. Over and above the 5 available flight modes, this also is a must have feature for most GPS enabled multi-rotors that all seem to need a 3 position toggle for GPS, attitude, and manual modes. Whether that be on a ready to fly Blade Vortex racing quad, or other multi rotor stabilization systems such as DJI's Naza M/2 or even their flybarless GPS autopilot Naza H system. The new 6 also supports seven different CCPM swashplate types and a multitude of wing and tail types for both airplanes and gliders. 5 programmable mixes along with dual aileron, elevon, and V-tail differential. Topping all that out with proven and easy to use AirWare software that once again has filtered down from higher end radios to this entry level offering. Spektrum has finally given us an entry level computerized radio with a back-lit display - yahoo! Nothing more to say about this other than it's about time. An entry level radio with a 250 model memory is unheard of! That model list becomes essentially unlimited if you wish to download models onto the SD card or your PC. Spektrum's excellent Model Match system is of course used so you'll never have to worry about accidentally choosing and flying with the wrong model selected. You can of course use a standard trainer cord with the Spektrum DX6 using the trainer port on the back of the radio (also useful for plugging the radio into a flight simulator). The other port is for head phones/ear buds, so you can listen to your radio without drawing too much attention to yourself. The wireless feature basically allows you to bind any DSM2/X protocol Spektrum or JR transmitter to your DX6. 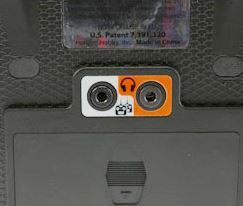 The 6 and DX9 basically also have a DSM2/X receiver inside them. The way it works is you bind the aircraft to your radio, and then bind your radio to the students radio. In other words, the students radio is transmitting to your radio and then onto the aircraft through your radio. When you need to take control over, just hold in the trainer toggle and that severs the students link to the aircraft and you now have full control. As I have often said, the DX6i is one of the best entry level computerized radio's for micro collective pitch right up to about 500 size. After that, I personally start questioning the robustness of an entry level quality radio with a $1K plus model. The Spektrum DX6 however with its shared DX9 DNA, is a different story and I would certainly trust this radio with just about every 6 channel or under model I currently fly. I know if I was just getting into the hobby and looking for a decent entry level computerized radio, the DX6 would be very high on my list. However, the DX6 is thirsty! Keeping it fed with AA alkaline batteries will, over time, cost a small fortune. I highly recommend getting the optional lithium ion 2000 mAh battery pack for it. It will pay for itself in a short amount of time, not to mention extend operation time between charges considerably. The one thing to keep in mind with the DX6 is the possible limitation of six channels. This can be somewhat of an issue with some flybarless systems because they generally map remote tail gain out to the Aux 2 (7th channel). There are of course ways around this but I did want to mention it. Also if you have any interest in scale RC helicopters where you might need an extra channel for lights or retracts, a DX7 may be the better long term choice (or of course the DX8 or DX9). Otherwise, for most people who are just looking for a solid performing six channel entry level computerized radio that sports quality & features of higher end radios for a low price - it's going to be a winning choice for many no matter what type of RC aircraft you fly!